We make decisions every day, every hour, about how to run our business – how to make it better, how to make it more efficient, how to motivate our staff, how to increase revenue, how to cut costs, etc. The daily decisions are endless. But – there is ONE thing that is seldom considered in these decisions. And, unfortunately, it’s the most important thing. Have to reduce staffing hours to cut costs? Okay, maybe that’s a possibility. But first – consider how will that impact customer accessibility to your phones, your storefront, having their questions answered? If you limit phone hours, yet your data shows that after a phone call to your company, 75% of callers make a purchase within 2 hours at your designated “break-even” purchase price, that cost savings will likely COST you more than you believe you are saving. When implementing a new process for billing – consider how this will be rolled out and explained to your customers. Will you spring it on them? Or will you give them 2 months of pre-notice and step by step instructions designed to help them through every step – and offer chat or phone help when needed? And… did you make sure your new process is as streamlined and EASY as possible? If it’s too much of a hassle, customers will look for your product or service with a company that makes life easier for them. 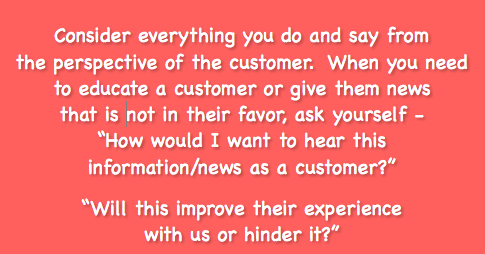 Consider the news or information you need to convey from the customer perspective. Keep in mind they are likely not in your world or lingo nearly as often as you are. Are you going to confuse them, irritate them, or help them.